An 8 year old boy finds a 20 dollar bill in a parking lot, and what he does with it can't help but touch your heart. Myles Eckert was with his mother when he found the money outside of a Cracker Barrel restaurant. Like many kids his age, his first thought was to use it to buy a new video game. But when he saw a man in uniform walk into the restaurant with his own family at about the same time, Myles says he had a better idea: "Because he was a soldier and soldiers remind me of my dad." 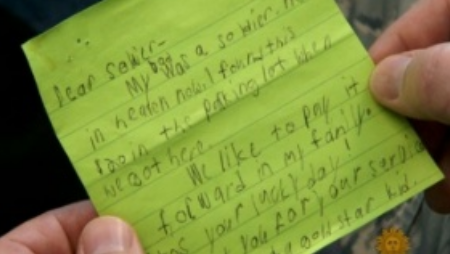 So he placed the 20 dollar bill in a green post-it note with this handwritten message: “Dear Soldier– my dad was a soldier. He’s in heaven now. I found this $20 in the parking lot when we got here. We like to pay it forward in our family. Its your lucky day! Thank you for your service.” Lt. Colonel Frank Daily was deeply moved by& the young boy’s kind gesture, saying, “It’s incredible being recognized in such a manner.” After paying it forward, Myles wanted to pay a visit to the grave of his father, who had died shortly after he was born. His mom snapped a photo of that moving moment when her son hugged his daddy’s headstone. As for Lt. Colonel Daily, hes already passed along the 20 dollars. Myles’ gift of generosity continues to inspire him to want to motivate others to “give” too. Good for You, Myles Eckert, for inspiring us all to pay it forward and to your mom for teaching you about what is truly important. Good for You, Lt. Colonel Daily, for wanting to encourage more acts of generosity and kindness. Who do you know that deserves a Good for You for making a positive difference in the lives of others? Why not acknowledge them with a Good for You Message and share it with us.